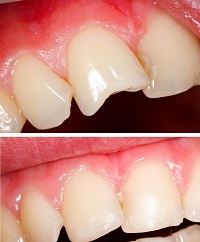 Bonding can be used to repair your teeth using a white filling material called composite resin. The resin is initially a soft paste which is cured with a light to harden it. This material is available in multiple shades and is contoured and shaped to look like a natural tooth. It can be used to repair chipped teeth, broken teeth, discolored teeth, and even to change the size and shape of teeth (such as closing gaps between teeth).